This amazing St Kitts quad bike tour will take you to parts of the island rarely seen by visitors. 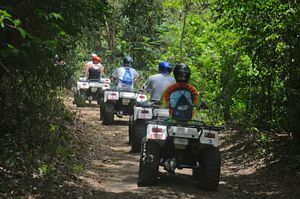 As part of your guided St Kitts ATV tour you will be taken on an excursion of the trails in the hills above Old Road, the first town that was established in St. Kitts. The tour travels off-road along sugar cane tractor paths and trails in the hills above Old Road, Verchilds, Middle Island and Lamberts. During the tour you will see a variety of plant species in the lush rain forest and view scenic vistas of the surrounding landscape, the Caribbean Sea and the surrounding villages. You will also hear the singing and chirping of the different birds that reside in the rainforest, and if you are lucky you may catch a glimpse of the Green Vervet Monkeys as they leap from tree to tree. During the St Kitts quad bike tour, your guide will point out various fruits that grow in the rain forest and may even allow you to sample the ripe fruits. The tour also takes you to the historic ruins of an old sugar estate. Ok, so your interest is peaked and you probably have some questions like... how does long this adventure off the beaten St Kitts track last, is quad bike handling training provided, what to wear and what is included in the tour among others. To answer your questions, the St Kitts quad bike tour includes transportation to and from your pick up point, quad bike handling training, the guided ATV tour and refreshments at the end of the tour. 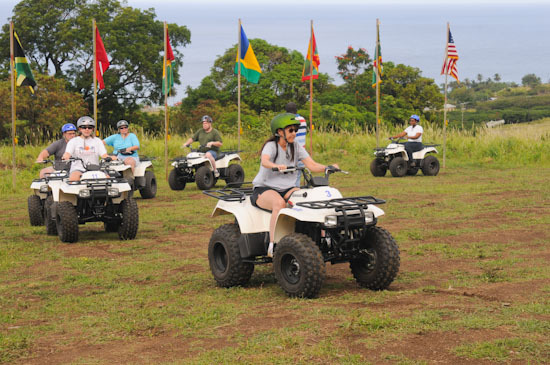 The duration of the St Kitts quad bike tour is 3 hours inclusive of transfer time, handling instructions and the end of tour picnic with refreshments. If you are visiting St. Kitts on a Caribbean cruise, pick up from and drop off at Port Zante where your ship will dock is included in the St Kitts all terrain vehicle tour. Three tours are available daily - 8:30am, 11:30am and 2:30pm. Either the 8:30 a.m. or 11:30 a.m. tour is recommended for most cruise ship passengers. Depending on what tours are scheduled for a particular day, we may be able to accommodate other tours at non-scheduled times. Drivers must be 16 years of age or older but younger children can be accommodated provided that they ride as a passenger. Drivers must also be 300 lbs or under to be able to operate the ATVs. And just in case you are wondering what to bring along and wear on this St Kitts quad bike tour and adventure, it is advisable that you wear closed footwear, rather than open shoes. Doing so will ensure your comfort as you tour the off roads on the ATV (quad bike). You will also want to make sure that you wear clothing suitable for off-road conditions. Prior to departing on your St Kitts quad bike tour, you will be given driving instruction and an opportunity to conduct a test ride. This is done to test your competence in handling the ATV. The training time usually varies according to ability and size of group but on average takes about 15 - 20 minutes. Once the training is complete, you will be on your way driving one of the ATVs on the tour. 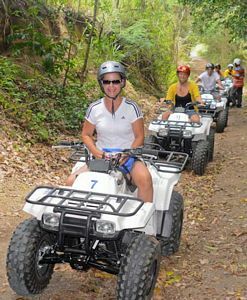 Then off you go on your St Kitts quad bike tour... all terrain vehicle tour... ATV tour or whatever you prefer to call it. Your tour will be led by experienced guides who will lead you in single file along the tour trail. 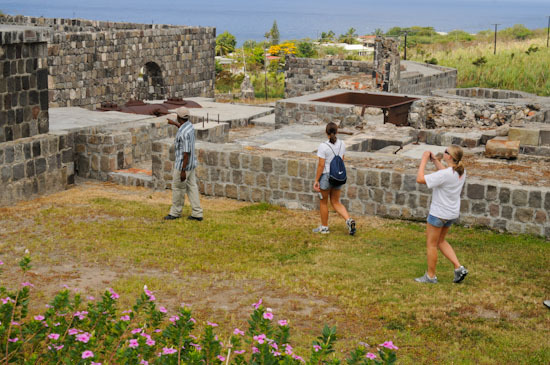 Along the way you will pass by the ruins of the historic Wingfield Estate and have the opportunity to explore sections of Lamberts Estate, both former sugar cane plantations. During the tour there will be information stops (including the historic Romney Manor, the home of Caribelle Batik) where your guide will provide general information about the areas being visited and explain the historical significance of the sugar cane estates that are visited. "Hi Amicia. I just wanted to say thanks for arranging such a great day with Elvis and Ado on the ATV Tours. We had a wonderful time! Our two daughters (ages 4 and 8) loved it, and we felt very safe with them on the ATVs. Elvis gave us a great tour of the island, and Ado was a wonderful guide on the bikes. We even saw 4 wild monkeys while we were riding. Overall, a wonderful day that we highly recommend to other families!" The tour was lots of fun. The bikes were in great shape -- very clean, easy to navigate and in good condition. Austin and Sylvester were both very informative guides stopping frequently to give us interesting information along our route. We got to sample fresh almonds, papaya, soursop, sugarcane and sage. Sylvester cut several pieces of sugarcane for us to bring home. We were hoping to see some wildlife in the forest but unfortunately did not. My son, riding behind Austin did see a monkey which disappeared before we could catch up. We saw no birds but did see several cows and a herd of goats with cute little kids. When we got back to home base, a small parade of colourfully dressed children was making it's way up the street. We got to see them do their traditional dance and my son joined in. Austin brought out a wonderful cold, homemade beverage with delicious homemade bread. It was exactly what we needed. We got to meet some of his family and then he volunteered to take us to the beach for the rest of the afternoon. Thank you so much for setting the tour up for us. I will highly recommend it to anyone I know who will be stopping in St. Kitts. I'm attaching a few photos for you to enjoy. Thanks Amicia and I hope that someday I get to meet you." There will be plenty of photo opportunities throughout the tour so do remember to bring your camera. After an amazing exploration, the ATV tour returns to the home base, where tour patrons can partake of complimentary refreshments and take a restroom break, before being transported back to their hotel, cruise ship or other pick up point. 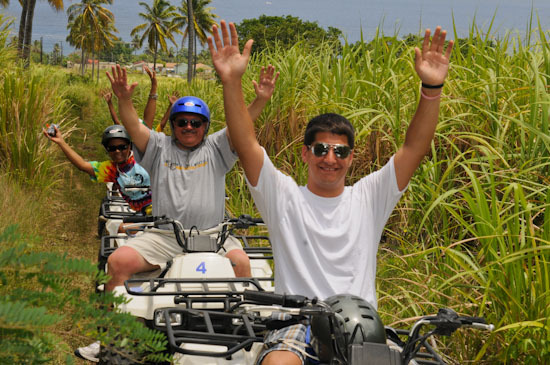 This St Kitts quad bike tour is an exciting Caribbean 4X4 self-driving safari that will thrill nature and adventure lovers... a definite must do on the list of things to do in St. Kitts. Interested in going to the beach to cool down after your ATV tour? No problem. By popular demand, I am pleased to announce that I am now offering an ATV and Beach Tour. 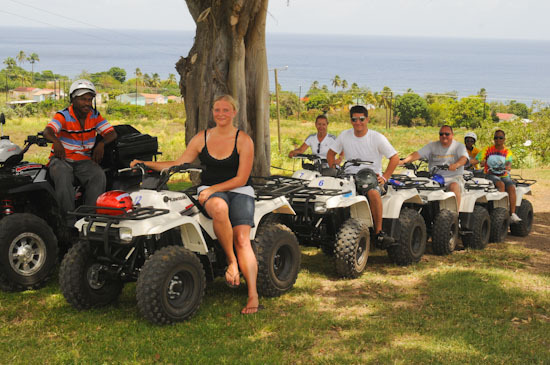 This tour combines the St Kitts quad bike tour experience described above with some cool down time at either South Frigate Bay Beach or Cockleshell Beach. You will have up to three (3) hours beach time to relax, swim or enjoy the water sports activities. Your pick up time from the beach will be pre-arranged with your driver. For cruise ship visitors, please note that we endeavour to get you back to your ship at least one (1) hour before its departure. 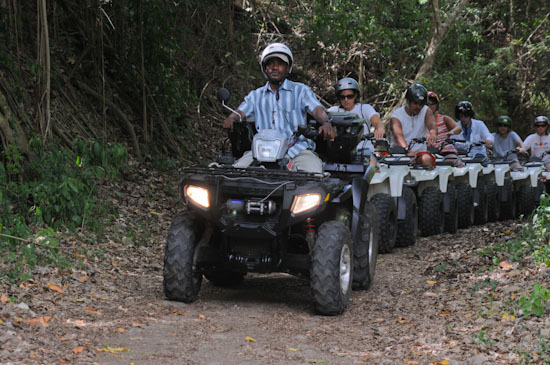 The 8:30 am tour is highly recommended for those patrons who want to enjoy the full St Kitts ATV and Beach tour. 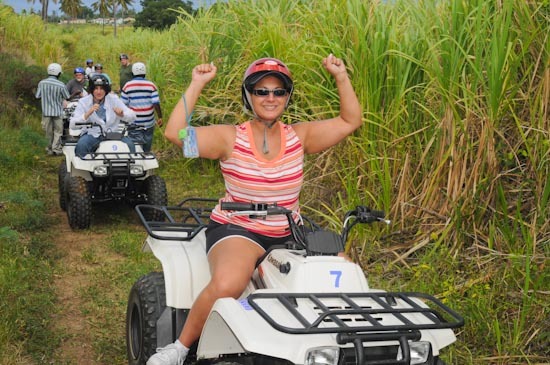 So how much do these amazing St Kitts quad bike tours cost? The cost of the ATV excursion only is US$95 per person (driver). The cost for children between the ages of 12 and 15 is US$55, while children under 12 pay US$40. The cost of the St Kitts ATV and Beach Tour is US$120 per person (driver). For children between the ages of 12 and 15 the cost of the St Kitts ATV and Beach tour is US$60, while children under 12 pay just US$45. 100% refund if tour is cancelled prior to 7 days before tour date and time. 50% refund if tour is cancelled 2 - 6 days before the tour date and time. No refund if tour is cancelled within 1 day (24 hours) of the tour date and time. Please note that because of contractual arrangements we are unable to accept direct bookings from passengers on Thomson Dream, Aida Bella, Aida Luna, Norwegian Breakaway, Norwegian Epic, Wind Surf and Costa Mediterranea. If you would like to book this off the beaten track St Kitts Quad Bike tour please complete the ATV tour booking inquiry form below. ---Select---\n8:30 a.m. 11:30 a.m. 2:30 p.m. When we receive your booking inquiry indicating which tour time and the number of persons, we will check availability. If there is availability for the tour requested, we will confirm availability and send you a PayPal invoice/payment request (click on link to see demo invoice) via e-mail. 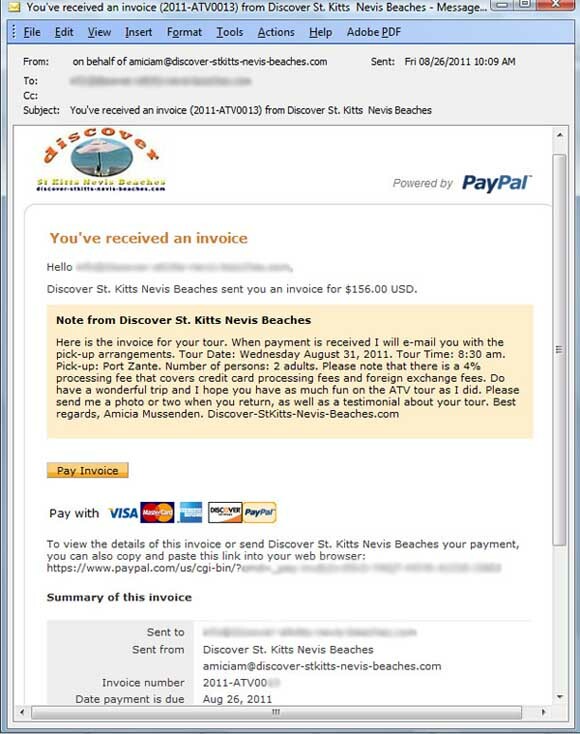 You will be able to pay the invoice online either by credit card or PayPal (if you are a member) by following the instructions in the e-mail. You will need to pay in advance in order to guarantee your space on the tour. This is so because in the past we've had persons reserve space (we turned down bookings because space was reserved) and they didn't show up for the tour. As the number of bikes is limited, we must receive payment in advance to guarantee your space on the tour. Please note that a 4% processing fee that covers bank and foreign exchange charges is added to the total cost of the tours booked. After the tour, please remember to provide us some feedback about the tour. Your feedback is important in ensuring that the quality of the tour is maintained. We have provided a number of options for you to leave feedback including sharing your experience via our Facebook page, Google+ page or by filling in the testimonials box at the bottom of this page. All of these methods also allow you to post photos from your tour. I look forward to reading about your tour experiences and viewing your tour photos.